Pansit-pansitan – Scientific name: Peperomia pellucida Linn. An annual herb, shallow rooted, may reach 40 cm high, with succulent stems. Leaves are alternate, heart-shaped and turgid, as transparent and smooth as candle wax. Tiny dotlike flowers scattered along solitary and leaf-opposed stalk (spike); naked; maturing gradually from the base to the tip; turning brown when ripe. Propagation by seeds. Numerous tiny seeds drop off when mature and grow easily in clumps and groups in damp areas. An annual herb, favoring shady, damp and loose soil. Often grows in groups in nooks in the garden and yard. Conspicious in rocky parts of canals. Leaves and stems may be eaten as vegetable. In salads, the fresh plant has the crispness of carrot sticks and celery. Infusion and decoction of leaves and stems are used for gout and arthritis. Externally, as a facial rinse for complexion problems. Pounded whole plant used as warm poultice for boils, pustules and pimples. Belongs to the “preferred list” of Philippine medicinal plants, being studied for its use in the treatment of arthritis and gout. 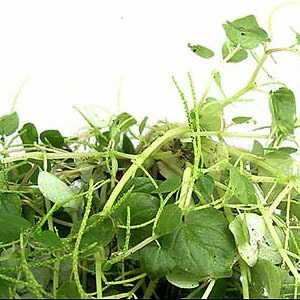 For arthritis: Leaves and stems of the fresh plant may be eaten as salad. Or, as an infusion, put a 20-cm plant in 2 glasses of boiling water; and 1/2 cup of this infusion is taken morning and evening. This entry was posted in List of Medicinal Plants in the Philippines and tagged Pansit-pansitan on March 24, 2009 by Pinoy Herbs. I hope I’m that intelligent too! does it mean this plant used as beauty coction? anu po ang pansit-pansitan lumot din po ba to ? maraming salamat sa naka discover, magagamot ko na nang herb ang gout ko. Hi I’m Nemar, 22, from Bicol Region and I’m currently working at the Bureau of Agricultural Research. Last month of April 2011 i thought i have gout because i cant walk and i feel i was punctured by needle when im trying to make a step so i decided to see a doctor and they say i might have juvenile arthritis not a gout they just gave me this medicine Celecoxib, although the pain was relieved it is just for an hour and since almost what were looking is on the web right now, i’ve made my own research and i found this Medicinal plant which is pansit-pansitan. On my first look at this plant, i knew it! we have a lot of this in bicol, it grows anywhere so i went home to check out these plant and boil them. Now im okay, only 500ml of those boiled plant make me well again. thanks to this wonder of nature. i appreciate your pansit-pansitan..it’s very delicous..